My Medical Apocalypse has allowed me to connect with many people and communities on many levels. I've been able to find others with similarities to my own experiences when they share their fights and struggles. When I find these connections it makes my own fight and struggles a little easier. Knowing I'm not the only one helps me. Hearing and learning about others surviving stage IV Lung Cancer, recovering from stroke and living with Moyamoya gives me a sense of community, guidance to face difficult situations and inspiration to carry on. This Is Me is my latest article for Lungcancer.net. it touches on how finding people that share their stories can inspire and unite individuals and communities. I don't usually share the down sides of my medical life. 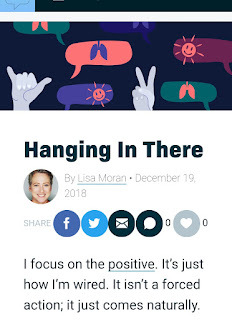 I mostly share the positives because, frankly, there have been a lot of great things that have come out my horrible and devastating diagnoses and medical mishaps. A part of me has the belief that if you verbalize something you give it strength. Then, why would I want to verbalize the negative aspects? But I'm going to share the crap and air my dirty laundry. I am disabled and unable to 100% take care of myself. I can function enough to get by, but I'm doing it with help and guidance of a caregiver. I'm finding flaws in many systems and organizations that are in place to help the disadvantaged and disabled. Because I have a whopping $19,000 a year Social Security disability income, I'm not a minor, senior citizen or veteran, I'm living in my own home instead of a nursing home or group home and going to adult day care, I fall in this grey area of qualification for assistance where and when I need it most. The last few weeks of begging these institutions for help has made me truly realize how and why so many mentally challenged adults are homeless. They fall in that same grey area I'm caught in now. Things have been hella tough since my December 2017 hemorrhagic stroke. When I returned home from the California inpatient rehab in January 2018, I was my optimistic self, thinking I would make a total recovery. I would gain strength, improve movement on my left side, regain my left peripheral vision, I'd return to work as a City Letter Carrier and the cognitive and memory issues would be behind me in no time. Despite the deficits and disabilities, I have accomplished many great things since my stroke. Looking back now over the last fifteen months, I can honestly say I don't know how I did it all. I can say, ignorance is truly bliss. My ignorance to the damage the stroke caused and the deficits I was left with has allowed me to achieve, otherwise, unattainable goals. I've always been confident in myself, independent and a self starter. That part of me translated into my stroke world and stroke recovery. I was a big girl and could do anything on my own, stroke or no stroke. Turns out, I was way wrong. Even as I continue to improve and learn new life skills, I struggle to live life without the help of my caregiver, my boyfriend, Jeremy. I gave Jeremy the title, “Knower of all Things” because he keeps track of my phone, day planner, clothes, sunglasses, shoes, medications and every physical item I can misplace while also keeping track of my finances, appointments, activities and daily medical and mental conditions, symptoms and side effects. I have a brain injury. I am not the organized, multi-tasking person I was before the stroke and I may never be that person again. I forget words, friend's names, conversations and events and appointments that are even written in my day planner. I put my clothes on wrong side out or backwards, or even wrong side out and backwards at the same time and not realize it. I can't remember to put away the refrigerated items after making a smoothie or sandwich. While I can blog and write short articles, each post and submission takes many hours of writing with breaks, naps and sometimes many days to complete. That's if I remember to complete them at all. I can't tell you the number of incomplete entries I have sitting in my files. I can start things as simple as letting the dog out, loading the dishwasher or showering for the day and lose track of what I am doing. At times I get so off track that I start new tasks, go to sleep for hours or for the night without ever knowing I left something unfinished. I've lost track of friendships and communications with friends and family because emails and text communications get confusing to follow. My need for independence and and to do things on my own has caused problems in my life. I was living and happy with my abilities and the things I could accomplish. I didn't comprehend the amount of time that had gone by. I didn't know I had forgotten important USPS information and items were being overlooked and left incomplete due to my inabilities to understand, remember or to start and complete the smallest of tasks. This blind faith confidence in myself caused confusion while applying for Medicaid. What should have been a couple hour process was days and weeks of phone calls and emails to try to figure out why I received an approval letter but no Medicaid information or enrollment card. To tell the truth, I'm not sure I ever received an acceptable explanation. A local agency that helps disabled people said they could only help me with the application process and can't help with other Medicaid issues. How does that make sense? When I was unable to return to work, I took advantage of the option to keep my health insurance through my employer. I was covered, reimbursing the USPS for the coverage when they sent me invoices. The plan was to carry the coverage into my disability retirement application process and be covered through retirement. I started the application process so many times thinking I could do it on my own. I called my HR Department three times over the last year about the disability retirement application. It wasn't until the most recent call, a few weeks ago, that I was told I was not understanding the process and procedures and going about the steps in the wrong order. I was also told there wasn't a program or person in place to help me complete and submit the application. I have more capabilities now than I have ever had over the last year, but I continue to struggle with completing the application and remembering where I've left off between attempts. My brain is smart enough to realize I'm getting confused and able to recognize the problems. It's just not smart enough to gather and compile the needed information and documentation to complete the application process. I didn't completely understand the rules of keeping my employer health insurance. I knew I had to pay the premiums to keep the policy active. What I didn't know was this was only the case within 365 days of Leave Without Pay (LWOP). I received a letter at the end of February notifying me I was past the 365 days and my health and life insurance policies were terminated as of February 1, 2019. My brain, that was healing and accomplishing so much, had let me down. I was forced to figure this out and pick up the pieces. I immediately called my HR department. From those calls I was told, in a very blunt but kind way, “Sorry about your luck, pal.” Rules are rules, no exceptions and no grace periods, even if I was going to file for disability retirement. I can't go without health insurance. In addition to the stroke, I'm in treatment for stage IV lung cancer. I tried to navigate the Colorado health insurance marketplace website. I called for help. I was lucky enough to be connected to the most patient, caring, understanding customer service representative. Brenda, wherever you are, you're a saint! She explained everything clearly and slowly so I could take notes. She explained things several times until she and I both knew I was understanding. My break in health coverage falls in time for my monthly targeted therapy chemotherapy medication refill. I notified my specialty pharmacy of the change in my insurance situation when it was time to order my tefill. At first I was told, no insurance, no problem, just pay the $17,000+ for the 30 day supply out of pocket. Then I was given a number for Astra Zeneca. I was told on the phone I qualify for the AZ and Me free medication program. I just need to fill out an application and have my doctor fax it in. That was a relief. But the real relief will come when I have that first bottle of medication in my hands. The next step is to complete the ever daunting and confusing federal disability retirement application process. My brain is healing and now recognizing when I need help. But I am in this grey area of the system. I don't qualify for Medicaid, so I don't qualify for the many programs that could help me in my daily living and possibly help with this application process. I know I'm not the first federal employee with a brain injury and mental challenges to apply for disability retirement. By the list of organizations and agencies I've contacted from my letter carriers union to The United Way to The Independent Center to The Colorado Cross-Disability Coalition, you would think I'm the only one that has ever needed assistance to do this. I worked hard, graduated out of my outpatient therapies and continued to work on my own to accomplish some of my goals, While I have made remarkable strides. The reality is, I have a long way to go if I'm able to make any more improvements at all. I will continue to work on daily cognitive and memory exercises on my own. I will keep up with my physical activities as much as the weather, my health and energy will allow. I'll keep walking my dog and returning to my swing dance lessons every week to challenge my body and brain to remember the steps and combos throughout the short class time and from week to week between classes. I will keep chipping away at this disability retirement application and eventually get it completed and submitted with or without the help of any government or nonprofit agencies. My latest article for lungcancer.net was written while the outcome of a late stage lung cancer diagnosis hit too close to home. Over a span of just a few days, we lost two important people in our lives to lung cancer. My boyfriend lost his aunt that treated him more like a son than a nephew and I lost one of my closest friends and lung cancer confidantes. When someone dies of cancer the horrible cliche, "lost their battle", is often used. As these women were transitioning to hospice care and the afterworld, the only thing they were losing was their life on earth. They won the battle. With that, they won the war. 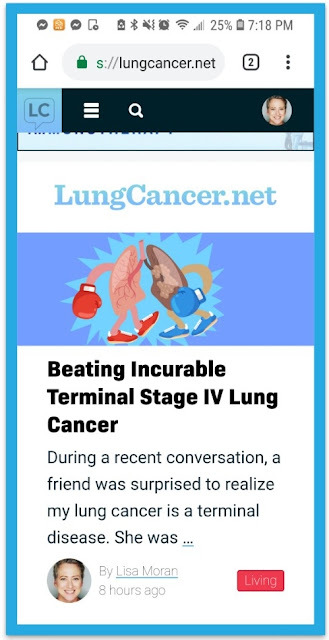 Click the article photo below to read my latest article, "Beating Incurable Terminal Stage IV Lung Cancer". After a lung cancer diagnosis you run into the question, Is there anything you wish you knew before your diagnosis that you know now? My answers have changed over the years. Today, my answer is, I wish I knew how much burden the diagnosis would put on my relationship with my boyfriend. 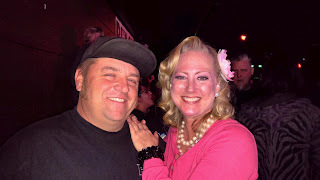 Lately, the biggest challenge has been dealing with the ongoing changes and troubles in our relationship after three and a half years of incurable, terminal, lung cancer and a hemorrhagic stroke. You would think life would get easier and we should be able to ride the wave by now. For us, as soon as we think we've got things under control, it only gets harder. Our basic relationship dynamic is constantly under stress. 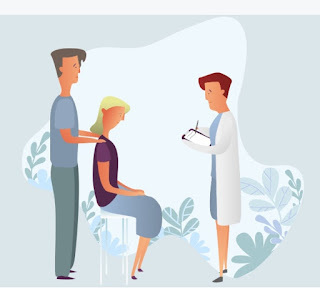 Click HERE or the illistration for my latest article in Lungcancer.net. The article touches on some of what we are dealing with. We have to learn to adapt, rest, recharge and live with lung cancer and all the added crap that life has handed us.